If I ever really wanted to punish my kids, I mean really punish them, I'd ground them from visiting the library — but they've never done anything quite terrible enough to warrant that kind of emotional pain and suffering. So here we are again with 9 more signs your kids read way too much. Which ones sound like your kids? Or maybe you when you were younger? 1. When your daughter is tired in the morning, her sister/roommate rats on her: she was up late last night secretly reading by the glow of the tiny red light on the carbon monoxide detector by her bed. I have to sweep my kids' bedrooms of reading material and contraband flashlights at lights-out or I know they'll be up all night reading. They've obviously developed methods to thwart me at this, but I do my best. 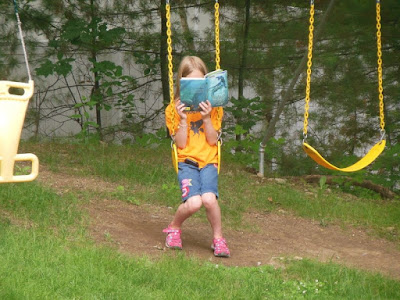 Playing outside looks different when you're a bookworm. 3. The kids beg to go to the library like their peers ask to go to Disneyworld. Even though they say they've already read everything there — and they're probably right. 4. For a class assignment, your daughter's teacher assigns a book to the class where they can't know the ending in advance. Your daughter has already read it. No problem, the teacher has an alternate title ready for that very circumstance. But your daughter has read that one, too. The teacher takes two weeks to find a suitable third choice book and assigns it to her, but gives her a modified schedule for the book report since everyone else started reading 2 weeks ago. Your daughter finishes the entire book before dinner that evening. 5. Your children own several book-themed items of clothing and merchandise. From the Percy Jackson series, for the uninitiated. Okay, a LOT of book-themed merchandise. A few items from our Harry Potter department. Legos not featured. 6. You're often summoned to evict someone from the bathroom who's been in there reading too long when others are waiting to use the toilet. Not sure where the rest are. Each kid is probably reading 5 of them simultaneously. 8. You have multiple copies of the same book in the house. I used to be so confused when I was picking up two or three copies of the same title around the house all day long. "Why do you guys do this?" I asked. Silly me, there was a perfectly logical explanation. Your kids bring home library copies of books you already own because "Somebody else is always reading them when I want to read them!" 9. If you happen to wake up in the middle of the night and see the bathroom light on under the door, you know you need to go bang on it and yell, "No reading in there! Go back to bed!" 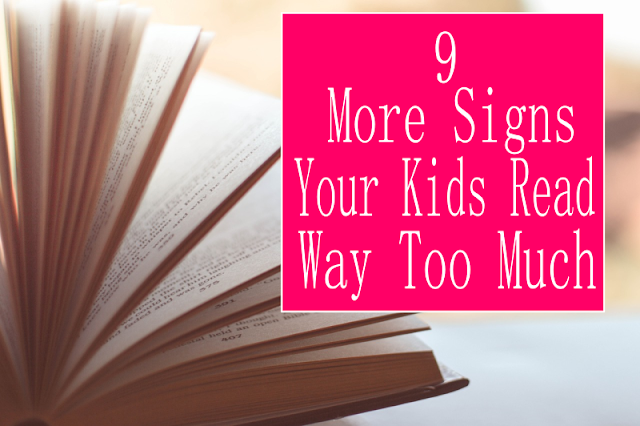 If this sounds like your house, you definitely need to go check out the original 9 Telltale Signs Your Kids Read Too Much. And then probably go knock on the bathroom door and tell whoever's in there to wrap up their book. Too funny. You're raising them right! My daughter is too young to read, but this was my childhood exactly. I would've fit in perfectly with your family. Also, I would add another to the list: bringing a book with you to "family movie night," so that you can sneak in several pages during the commercial breaks or while the rest of the family is going through the pre-movie bathroom and popcorn rituals. This is hilarious and totally brought me back to my childhood. I hope my son grows up to be a book worm, too. Right now when he gets alone time with them he just tries to eat them. You're obviously raising them right! Love this! Can kids really read too much? Okay if they don't get enough sleep, but other than that... I can get lost in a book too. You're a good mom. I can tell. That's hilarious. Did you ever tell your mom as an adult, "Remember that time when...?" We actually had that same experience last weekend. We sat down to watch The Lion, the Witch, and the Wardrobe and my oldest brought a book to read while it got started. Ten minutes into the movie I looked over and she was still stuck in the book! We had to remind her where we were so she could pay attention. Well, that does happen first. At least you know he likes books! I'm crying from laughing... this is my family. Well... more specifically myself and my four year old. We had a librarian help us out to our car this morning because the TWO BAGS that I brought with us to the library wasn't ENOUGH! I have a library card and my four year old has his own, because apparently 50 items checked out at one time is too few. True story (and now probably a blog post for me): we were at the library last week (because we go EVERY WEEK) and my son was reading some dinosaur hardcover graphic novels in his favorite chair. A librarian (new to the library) came over and said to us that were other, probably more age appropriate, dinosaur books over "there" (and pointed). Another librarian poked her head out from the next row and goes "he's read all those already. He's here all the time." That's too funny. The librarians know my children very, very well too, and will often approach them with books saying, "This just came in and I thought of you right away!" We don't have limits on our library card OR fines until it's 45 days overdue, so we get in big trouble. That's probably a future blog post for me! Number 9 on your list for real?! My kids are terrible right now with their electronics. I am forever yelling at them to just go ahead and put it away and read. It angers me. I do believe electronics are going to be gathered up this week and returned only after multiple books are read. Hi Jenny, I have a bookworm for a daughter. When I was pregnant I was obsessed with collecting books for us to enjoy together, which may have contributed to her love of books (although I was the same with my son, who probably can't remember when he last opened a book for pleasure). The times I've had to go in and tell her it maybe wise she gets some sleep I've lost count of, but at sixteen and being something she has always done I don't think she'll be stopping anytime soon. And as for reading in the bathroom? Her legs must have gone dead soooo many times! I think I probably am fighting a losing battle at this point, but it could be worse! Like so many commenters, I was a child bookworm too! My parents did ground me from reading a few times when I was in trouble! Also, my parents told me that I was not allowed to read at recess - I had to try to make some friends, instead, lol! That sounds exactly like my kids! During the summers we usually limit reading time like you would limit TV time, because otherwise that's all they'd do. I used to be a real bookworm (though not to the level my kids are!) when I was a kid, too. Now I read maybe 2 books a year, excluding ones with pictures or lift-the-flaps. Something to add . . . Your child sustains injuries from walking into walls or falling down the stairs because they try to walk and read at the same time. As I'm reading my 6yo is reading boxcar children's book on the outside swing glider. My DH and I LOL at these points! It is great to have another mom who has this "problem"